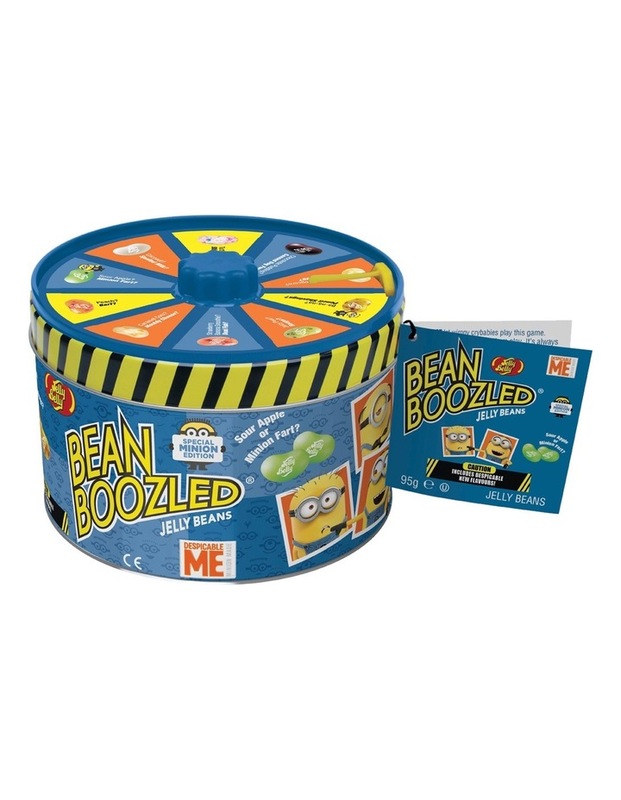 Beanboozled gets downright despicable in the special edition jelly belly beanboozled minion spinner tin. Jelly belly captures the mischievous nature of illumination's minions with a special selection of beanboozled flavours, including two new look-alike pairs. Illumination's minions love bananas, that is why classic beanboozled favourite pencil shavings is back and paired with ba-na-na. New to the weird selection is a flavour inspired by despicable me character Dr. Nefario and his most memorable gadget, the fart gun: in this edition, jelly belly pairs delicious green apple with deplorable minion fart. The tin contains a colourful mix of jelly beans featuring yummy flavours and weird flavours. The weird flavours look just like the yummy flavours so can never be sure what flavour you have picked until you put the bean in your mouth. Flavours of jelly beans: spoiled milk, coconut, dead fish, strawberry banana smoothie, rotten egg, buttered popcorn, toothpaste, berry blue, barf, peach, canned dog food, chocolate pudding, booger, juicy pear, pencil savings, ba-na-na, stinky socks, tutti-fruitti and minion fart, sour apple. The jelly beans are randomly assorted and may not contain every flavour. The tin features a spinner top lid. Spin the wheel to take on the beanboozled challenge. Jelly belly is family-owned and operated company. Their candy-making roots can be traced back to 1869, and began making jelly belly jelly beans in 1976. Jelly belly beans are gluten free, dairy free, gelatine free, peanut free, azo-free and certified ou kosher. 95g net product of thailand. Ingredients: sugar, glucose syrup, modified cornstarch (1440), flavours, concentrates (apple, pumpkin, carrot, spirulina, black currant, hibiscus), colours (100, 150a, 162, 171), salt, banana puree, acidity regulators (270, 296, 327, 330, 331), glazing agents (901, 903, 904), peach puree concentrate, chocolate (sugar, cocoa mass, cocoa butter), pear juice concentrates, cocoa powder, apple juice concentrate, dried coconut powder, thickener (1400).